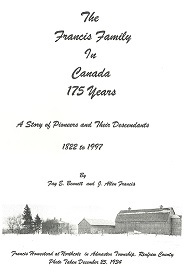 [S464] Founding Families of Admaston, Horton & Renfrew Village. [S776] Plaque at Rosebank Cemetery. [S111] Census - Canada, Ontario, Grenville Co., Wolford Twp., - 1861. [S899] Vital Statistics of Ontario- Death Certificate of Elisha Francis, (Name: LDS;), 014354 91 (Reliability: 3). [S729] Obituary of Elisha Francis in Renfrew Mercury. [S3] "Ontario Death Registrations Online at Ancestry.ca", FamilyTree.Com, (Name: Subscription www.ancestry.ca;), # 011354 Admaston Twp., Renfrew Co., Ontario (Reliability: 3). [S499] Gravestone of Elisha Stuart Francis.